The maturity of middle age brings with it some wonderful benefits. Being firmly established in life and past the uncertainty and upheaval of youth often equates, for most people, to a more stable environment. A time to focus on our family, our goals, our careers, and our leisure time. There are, of course, a number of concessions that folks in their Forties, Fifties, and Sixties must make. One of them (for most of us in the modern economic environment) involves remaining in the work force for at least several more years. Another is acceptance that there are certain advantages that we now have to live without; nothing we can’t handle, just the little blessings of youth, like the ability to focus on objects in close without a pair of reading glasses. If you’re at that age where presbyopia limits your up-close focus or ability to read, and your work or your leisure activities pose a potential risk to your eyes, you’re likely in the market for safety glasses with reading lenses. 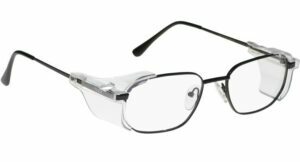 These lightweight frames combine the high-quality, impact-resistant polycarbonate lenses of standard safety glasses with the magnification area of a pair of reading glasses, resulting in lightweight glasses that provide both protection and clear, focused in-close vision. Black, Aviator shaped full-frame made of metal. Equipped with side shields for lateral protection. Full-frame wraparound style for maximum coverage. Black frames made of plastic. Lightweight, stainless steel frames with a rectangular shape. Rubber temple bars eliminate any pressure points behind the ears. Spring hinges for a comfortable, solid fit. Removable side shields for additional protection where and when you need it. Grey, rectangular shaped full-frame made of metal. If you’re old enough to benefit from reading glasses but young enough that your daily work chores or recreational activities pose a potential threat to your eyes, visit Rx Safety today. Another benefit of maturity is wisdom, and properly protecting your eyes while ensuring clear, effortless vision is indeed a very wise move.